When in Manila, Japanese cuisine is one of the staples that Filipinos would love it eat. We are not new to it but lately, this deep fried until golden brown pork cutlet named Tonkatsu is gaining more and more popularity. As the battle for the “Best Tonkatsu in Manila” rages, Saboten will surely tickle your taste buds and fare for the title. 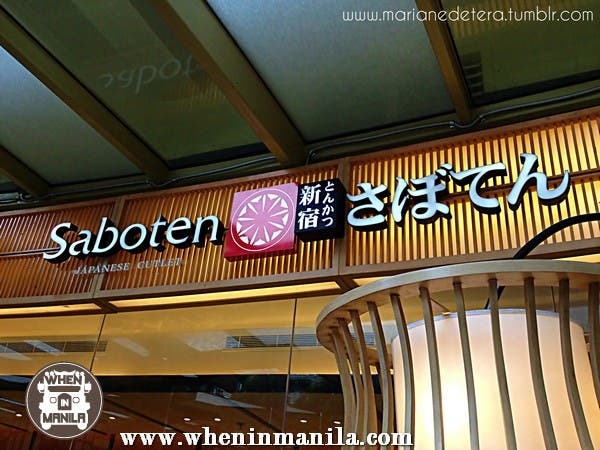 Saboten Philippines is a franchise brought to you by Raintree Restaurants, which is one of the largest Tonkatsu chains in Japan with over 500 shops in Japan, Korea, Taiwan, Thailand, Singapore, Hong Kong, Canada and China. With over 4o years of experience, that started way back 1966 at Shinjuku, Japan. 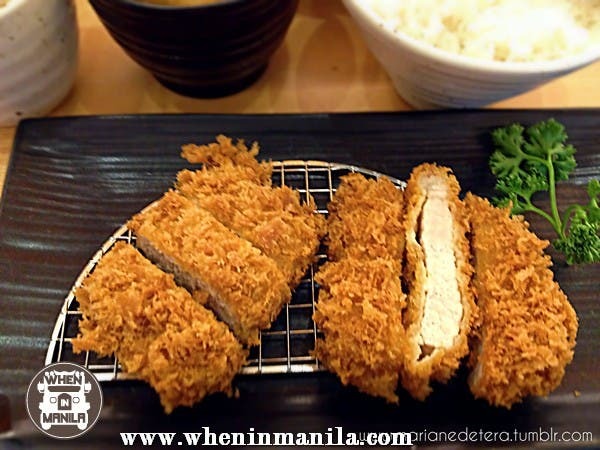 Saboten brings only the best and authentic ingredients shipped all the way from Japan to bring “The Original Taste of Tonkatsu” here in Manila. Their chefs even went through an intensive 10 day training in Japan and in their Hong Kong branch to make sure that the standard and exquisite taste is what Saboten Philippines would offer to Filipino foodies. To add up to that their interiors is designed by a Japanese interior designer. Saboten’s Tonkatsu is generally served with shredded cabbage, miso soup, rice and pickles. Their set meals is a must cause they are served in unlimited quatities perfect for Tonkatsu lovers and foodies out there. Their shredded cabbage, drizzle it with Saboten’s sesame dressing and it makes a perfect side salad. Don’t forget to enjoy your Tonkatsu with Saboten’s pecial Tonkatsu sauce mixed with grounded sesame seeds which you ground yourself using a wooden pestle and a grinding bowl called suribachi. Sesame seeds in suribachi waiting to be grounded. For those who would try saboten for the first time it is recommended for you to try Saboten Special set (P525), Served with refillable miso soup, pickles, shredded cabbage and Japanese rice, the set includes one deep fried shrimp, one loin cutlet (65g), one tenderloin cutlet (30g), and a crab cream croqutte. There are also other choices on there menu that gives a refreshing twist on the original Tonkatsu. A refreshing take on Tonkatsu where it is topped with grated radish and grapefruit. Their choices of appetizers are also to die for. Pickles, Radish Salad with Plum dressing and Chicken with Onion Radish and seasoning. When asked what’s their secret for having the best Tonkatsu in town, according to Chef Porschia, the reason for their melt in the mouth Tonkatsu is that the meat is being cured in special sauces for at least two days and the Panko (Japanese Breading) is made especially by a bread technician flown all the way from Japan. And all the ingredients that they use is also flown from Japan to preserve its authenticity. They did not alter its original recipe to fit Filipino tastebuds, it’s recipe is the same from what they have in Japan. 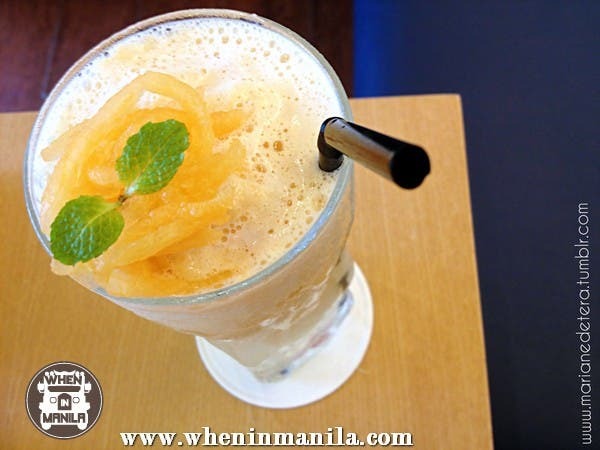 Saboten’s Mango – Yakult(115) a refreshing drink to pair up with your Tonkatsu. After enjoying your delectable meal, your lucky enough to still have room for desserts. Try out their Strawberry Shortcake, Chocolate Hazel Nut cake and their Gree tea cake and ice cream. Saboten’s menu ranges from 500 – 800 per person, this may seem expensive for most people but the quality, taste and service is what will make you coming back for more to Saboten. No wonder despite its price Saboten is ofen packed with people during lunch and dinner time. They do not accept reservations only waitlisting. They do not only offer the finest ingredients but they also provide world class service. The waiters even bow, just like what the Japanese people do. So if you’re planning to bring the gang or simply have a date you better come early or else you might have to wait a little longer. Some Japanese people spotted enjoying their meal at Saboten. The lovely team. Marketing Managers, Ianna Ma and Elline Buenaventura, me, Chef Porschia. The foodies, Robee Sunga and Nica Carlos. The Photographer, Gino Ong. When in Manila, there no other place to enjoy your fare share of Tonkatsu madness other than Saboten. Experience Saboten. Experience the taste of Japan. Special thanks to Marketing Managers Ianna Ma and Elline Buenaventura, Chef Porschia, foodies Robee Sunga and Nica Carlos and Gino Ong for the photos. Additional photos courtesy of Saboten Philippines. Our new chocolate obsession, and soon to be yours too! 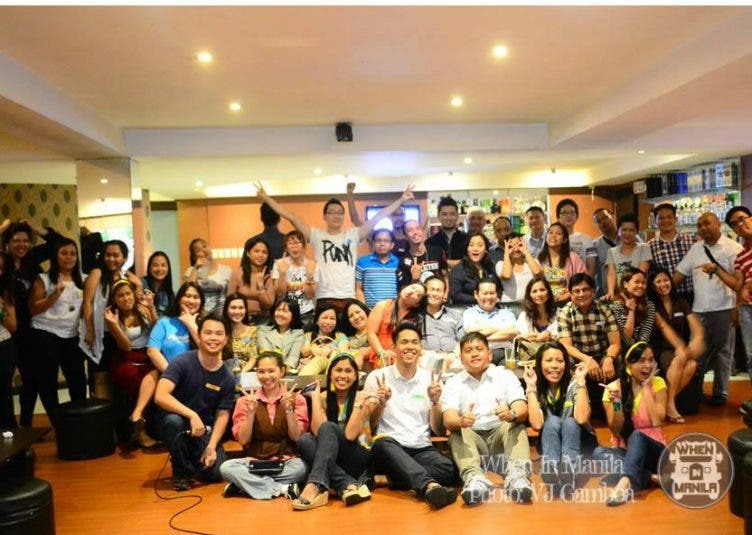 Join the Magnum Infinity Hunt to try it this Saturday!